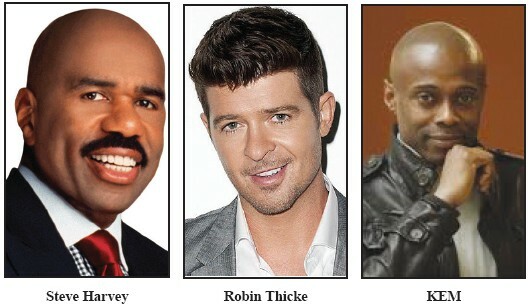 Television / radio show host and bestselling author, Steve Harvey, has announced that Grammy nominated superstar recording artist, Robin Thicke, will open the 12th Annual Ford Neighborhood Awards with the evening’s first performance. With what’s sure to be an exciting display at the Neighborhood Awards, Thicke joins the list of world-class talent already confirmed to perform including, Chrisette Michelle, Tamela Mann, India Arie, Anthony Hamilton, Iohnny Gill and The Ray Chew Band. The Neighborhood Awards will be held at Philips Arena in the city of Atlanta for the first time on August 9, 2014. In addition to the awards show, Harvey will host four days full of activities (August 7th – 10th) at the Georgia World Congress Center and Philips Arena. The schedule of events includes, a Stand-Up Comedy Iam hosted by Nephew Tommy, the 3-day State Farm 2014 Neighborhood Awards Weekend Expo, the Table Classic Championships hosted by Iunior, the Neighborhood Awards Freedom Friday Party with performances by KEM and The 0’]ays, the Ford VIP After-Party with a performance by Bell Biv DeVoe, The Steve Harvey Morning Show live broadcast presented by Coca-Cola, featuring performances from John Legend and George Tandy Ir., Family Feud Live presented by Ford, and more.